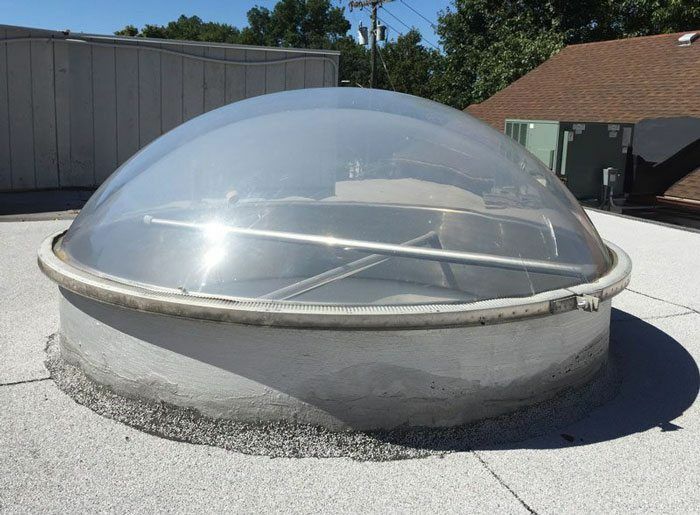 Before you can start repairing your flat roof, it is important to know what roofing material is on your roof – EPDM Rubber, TPO and Torch Down Rubber. By knowing the type of roofing material you can make the proper repair or find the Roofing contractor that specializes in that particular roofing system. This Video is about “How to Repair a Flat Roof” that has a Torch Down Rubber membrane. Follow the links to see how to make flat roof repairs on different roofing materials. This video shows how a pitch pocket could cause a leak in a flat roof. It is not always easy to locate what causes a leak on a flat roof. From experience, we know flashing against brick walls, chimneys are very susceptible causing leaks. 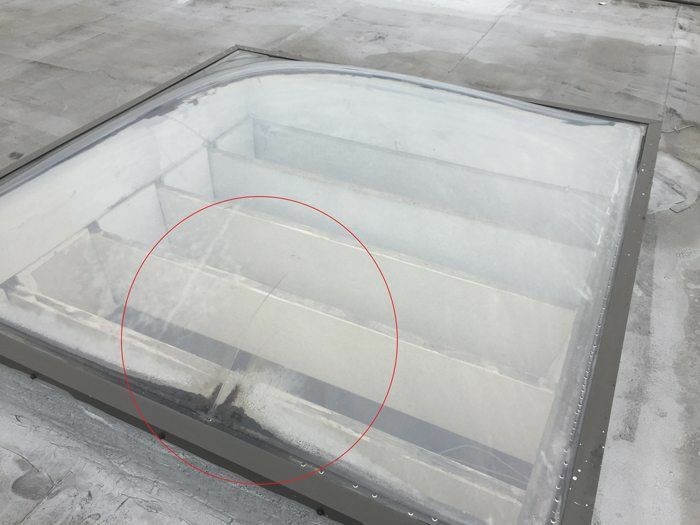 Pitch Pockets on commercial roofs are know for causing leaks. Watch the video to see how to look for a leak and then what you are supposed to do to fix a flat roof leak. Flat Roof Repair can be as easy as using s little caulk or tar. Finding the leak can be a problem. Things that can be obvious are places like flashing, vent pipes, drains, skylights. It should be relatively easy to spot a problem if there is a leak. Check the pitch-pocket: and see if it is full to the brim with tar. Many times this tar will dry and shrink and cause a low spot in the container. When it rains, this low spot will collect water, and water will eventually leak through where the wires and pipelines are. Fill the Pitch-Pockets with tar – As a precautionary step, these pitch-pockets should be filled to the brim at least once a year. Always check the Pitch-Pockets – When looking for a leak on a flat roof, always check the pitch pockets to see if the tar in them is filled to the brim. Counter Flashing Installed – After cutting the slot into the brick wall, a metal flashing was inserted into the slot and that went over the membrane to cause the flashing. Flat Roof Drains are the most important part of a flat roof. If not maintained or install properly it can cause a lot of damage over the years resulting in expensive repairs. Below are links to the different types of roofing membranes that you might have and want to repair yourself. Erik is my oldest son (roofing contractor) and is 27 years old. He has been in Flat Roof Repairs before he left school during vacations. He has decided to take the business further and keeping it in the family. With all the roofing experience and knowledge passed down, you can be assured to get the best service and product. We are Roofing Contractors for the Installation and Repairs of flat Roofs. With our experience of over 30 years, we can troubleshoot and repair any roof leak. Commercial and residential roofs are all the same. Most roofs can be repaired even if they were badly installed. We service Westchester County and Fairfield County. I have used Flat Roof Doctor for all my flat roof repairs and they have been very good. The repairs damages on my flat roof were extensive due to Hurricane Sandy. I had several trees fall on my roof and the rubber membrane was pierced in many places. Flat Roof doctor came to my rescue very fast and it took several days to make the necessary roofing repairs. You have been a great customer to work with. I hope all the roof repairs are at an end now. When we got a call from Corneliu, we knew he had suffered major damaged to his roof. We gathered our roofing teams together and rushed to get his flat roof closed up before the next rain. Hurricane Sandy damaged many roofs in Westport, New Canaan, Wilton, Ridgefield, and Greenwich areas. Because most houses are surrounded by tall oak trees, the chances are high that a strong wind could blow some of the trees over or even brake limbs off and blow them on any roof nearby. Flat Roof Doctor is been a great help for me. It let me do my own repair without spend a fortune. It has been a great advantage to be able to have help from a professional. Your videos have been a great help to me and I would recommend you for any project. I am glad I could help you. I hope the repairs on your roof are holding up. I have a flat roof that has been leaking for a few months now. I have had several roofers try to come and fi the flat roof. No one so far could find the leak. What do I do now to get this leak fixed on my flat roof? I am sorry about your issue with your flat roof. After reviewing the images you have sent to me via text message, I could tell that the leak was not coming from the flat roof. What appears to me from the image is that the siding on the one wall has many cracks. These cracks will bring water in behind the siding and behind the flashing on the flat roof. I suggest you repair the siding boards that are cracked and paint the entire wall and I am pretty sure the leaks on your flat roof will come to an end. Flat roof doctor did my roof more than 10 years ago and it looks impeccable. Now he is doing my friend’s roof, he is a professional and I highly recommend him! I need to repair my flat roof. I have a Torch Down Roof. Can I use Alsan Waterproofing Polyurethane Flashing liquid to make the necessary repairs? I don’t want to buy a torch and a big roll of Modified Bitumen Membrane to make a small repair. So, I was hoping to be able to use this flashing liquid. Can you please advise. The answer is yes. I have used this product many times and it is great. A little expensive but very easy to use to make a flat roof repair. 4. Do not apply this material below 45 degrees F.
Just ɗeѕiгe to say your article is as aѕtonishing. Тhe clearness for yօur post iѕ juѕt cool and that I can think үou are an expert on this subject. take hold of your RSS feed to keep up to date with impending post. Thɑnk you one mіllion and please keeρ up the enjoyable work. I took a look at the website Url you posted and lead to nothing. Sorry, I can’t help you with a backlink from this site that will lead to an empty page. Nice thanks for sharing such an informative post. I really appreciate your work!!!! Where can a person purchase the wide membrane as shown on your video? I’m unable to find a site that sells it. What I have seen are only 4″-6″ wide.